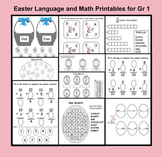 This is a PDF file with 10 Easter Printables in both Language and Math for Gr. 1 students. Download the preview to see a thumbnail of all 10 pages. Students add and subtract 3-digit numbers and then follow the directions to color the eggs (odd and even). This can be used as independent practice, put in a math center, or used as a common formative assessment. 2" printable Easter label that reads "You're one of my favorite peeps!" Attach to the top of a bag with a PEEP inside for a fun, festive, inexpensive treat for your class or your child's classroom. 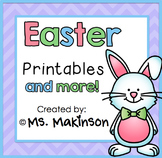 4 Easter Printables-PreK/K LA Activities! These super cute Easter printable bookmarks will have your students excited about the holiday in no time. This product comes with 8 different Easter themed black and white bookmarks. Print them on cardstock, color, and cut out. Easy, fast, fun! 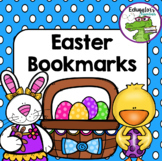 Check out some of my other fun printable bookmarks: St.
Easter printables contains fun sheets for your students to completer. 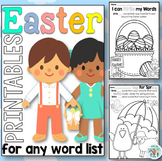 It has Easter worksheets that work on odd and even numbers, nouns and verbs, and synonyms and antonyms. 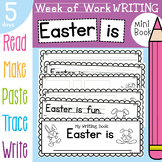 There are also some more fun Easter printables in the packet.